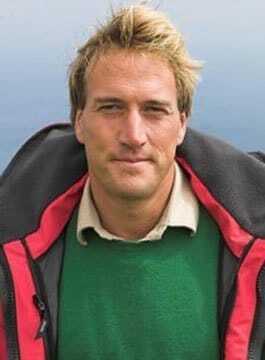 Ben Fogle was born in 1973, the son of actress Julia Foster and broadcast vet Bruce Fogle. Educated at Bryanston School in Dorset, Ben Fogle went on to study Latin American Studies at the University of Costa Rica and University of Portsmouth, where Ben enrolled as an Officer in the Royal Naval Reserve, as a Midshipman. In 2000, Ben volunteered to be marooned on Taransay, a remote windswept island in the Outer Hebrides as part of the BBC’s big millennium project Castaway 2000. Numerous appearances have included Panorama, Richard and Judy, Graham Norton, Paul O’Grady, This Week, The Wright Stuff, The Kumars at no. 42, Grandstand, the National Lottery and the BBC’s Abyss interactive. Ben has written a number of best-selling books including: The Teatime Islands, Journey’s to Britain’s Faraway Outposts, Offshore: in search of an island of my own and The Crossing, Conquering the Atlantic in the World’s toughest Rowing Race co written with James Cracknell and published by Atlantic Books. Ben’s writing has appeared in numerous titles including: The Daily Telegraph, The Guardian, the Sun, Country life, and Glamour magazine, the Daily Mail, the Evening Standard and the New York Times. Ben’s sporting achievements have included beating actor Sid Owen in a three round charity boxing match for BBC Sport Relief. He has completed the Marathon Des Sables, a one hundred and sixty mile, six day, self sufficient race across the Sahara Desert which he ran for WWF. He has completed the Safaricom Marathon in Kenya for the TUSK Trust, rowed across the Atlantic Ocean with Double Olympic oarsman, James Cracknell, in 49 days, setting the British pairs record and in 2009 teamed up with Cracknell once again to race 500 miles on foot across Antarctica to the South Pole. Ben has won a Royal Television Society (RTS) award for the highly acclaimed Through Hell and High Water and has been nominated as TV personality of the Year and as Best New Talent. His first book, The Teatime Islands was short listed for the WH Smith’s people’s award for Best Travel book. Ben has also been awarded an Honorary Doctorate of Letters from the University of Portsmouth. Ben has since presented numerous programmes including the BBC’s Animal Park, Countryfile, Wild in Africa, Crufts, One Man and His Dog, Holiday, Cash in the Attic, Extreme Dreams and Country Tracks.